14 | June | 2006 | Did You See That? 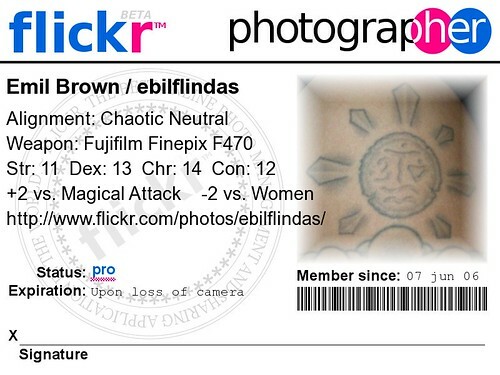 My flickr badge, originally uploaded by ebilflindas. I am now a flickr pro. Yup, barely a week, and the free account became too restrictive. I gots shots to put up! I needs room to upload my visions. So I went pro. Straight up. One cool thing in flickr is that you can save other's photos as favourites, and you can see who (if anyone) has saved any of your photos as their faves. Well, as I was discovering this, I was going through my photos, reading how many times each one had been viewed, who has added each one to their list of faves, and how many comments have been left. As I've only been on flickr a week, I was mildly pleased to see the handfuls or so of viewings each picture has enjoyed, and that one has even elicited a (nice) comment from a stranger. Then I stared in disbelief as I read the line, "Nobody counts (photo filename) as a favourite." I couldn't believe it. Nobody actually saved my photos to their favourites list! Now, I don't mean that I was shocked and amazed that not one person would add any of my photos to their fave list. I actually thought "Nobody" was someone's flickr user-name!